I’ve posted a lot recently about my SharePoint development work. It’s a topic I know quite a bit about (if I do say so myself), but this is not a SharePoint blog and I have no intentions of making it one - it’s simply that I blog mostly about my work, of the nine projects and tasks I have on my plate currently five of them have at least some kind of custom SharePoint component to them, and two are full-blown web-apps built on top of SharePoint. With so much going on how, I hear you ask, do I stay organized and keep on top of things? I’ve been aware of mind mapping for quite some time, and about a year ago I read a lifehacker article comparing mind mapping tools. I was interested but I didn’t have a good use-case for them at the time, and I’m not a fan of technology just for technology’s sake. What’s changed in the past year is the nature of my work. A year ago a was adhering fairly closely to the title of Business Analyst that you’ll see on my business cards - I was involved in a relatively small number of projects at a time, but I was usually only responsible for delivering on a subset of the overall scope. As my role has evolved, I find myself putting on my project manager shoes much more frequently. I have a larger number of projects, and while I’m ultimately accountable for delivery on all aspects of them, I can’t possibly make myself responsible for every detail or I’d drown in minutiae. So a few weeks ago I downloaded XMind, as recommended by lifehacker readers, and I fell in love with it almost immediately. At the centre of my map is a node called “To Do,” but that’s probably a bit inaccurate and it speaks to how I thought I’d be using the tool rather than how I actually ended up doing things. Off that I hang projects, initiatives, and tasks, and branching out from those are multiple things. There are to-do items for myself, often broken down into sub-tasks in a WBS kind of way, questions that need answers, and tasks where I’m waiting on other people. XMind has markers (different types of symbol you can attach to a branch) and I use these to differentiate the types of sub-item I use. I track completion of my own to-do items on an eight point scale, I assign priorities to things, I add notes, and I call drill-down into a view of a single branch in the tree if that’s what I happen to be focussing my attention on at the time. That’s all kind of irrelevant, though. The end result is representative of a map of my mind and how I work, and your mind and approach to your work are probably not the same. The point is that the tool is flexible enough to work for you, however you choose to use it. 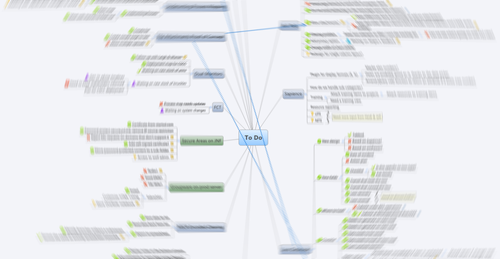 Regardless, mind mapping helps me keep track of the many things I have going on in a very easy to understand (for me) way. I now have XMind open on my computer more or less all day long, and it’s quickly become my go-to productivity tool.